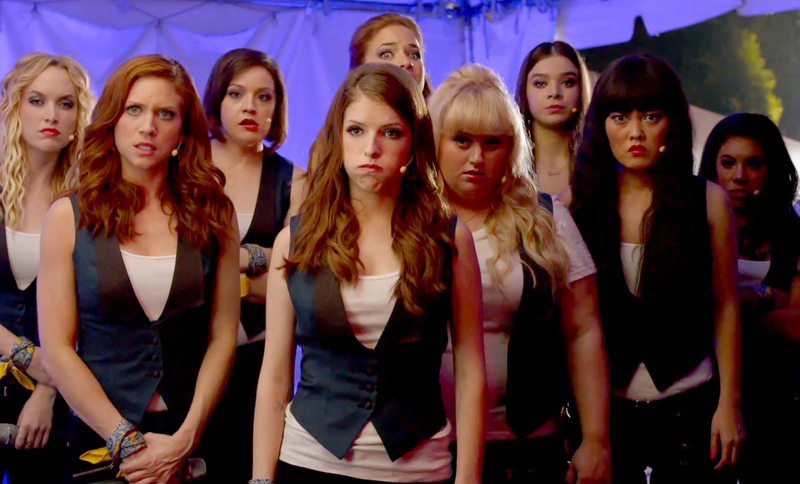 Elizabeth Banks brings back ‘The Barden Bellas’ for a second instalment of everybody’s guilty pleasure, PITCH PERFECT. With the World A Capella Championships just around the corner and ‘The Bellas’ global status soaring since their win at the end of the first film, only a major slip up could cost them everything they had been working towards. Unfortunately thanks to a humiliating finale to their command performance at the Lincoln Center from the comical and sarcastic Fat Amy (Rebel Wilson), who holds a more important role than in the first film, this is the case. After Fat Amy’s slip up, the Bellas find themselves banned from representing their college and even from recruiting new talent. However, their inclusion in the World A Capella Championships in Copenhagen, cannot be taken away from them, which leaves us with a film following their journey to this defining moment in the a capella group’s history; trying to win a global competition which has never before been won by an American group in order to save the legacy of The Barden Bellas. Fortunately a “Legacy” (a daughter of a former Bella) in the form of freshman Emily (Hailee Steinfeld) comes along, who sings her own, original songs (this is supposedly very rare and frowned upon in a capella world) and begs to be a part of the Bellas, adding to their line up and hopefully their chances at the “World’s”. Anna Kendrick plays Becca, one of the original new faces from the first feature, who is now co-leading the group with Chloe (Brittany Snow). On the side of the Bella’s attempt to save face and defeat the German champions and new global favourites, Das Sound Machine (DSM), Becca is trying to build a future for herself as a music producer, interning at a recording studio. Could this opportunity take place of Becca’s commitments to the Bellas and cost the group their survival? Once again, Pitch Perfect brings a strange kind of escapism for the viewer, drawing you into an a capella college world full of 90s hip hop, classic and current cover songs, slapstick comedy and over-blown arguments. You are always eager to see what they sing next or what will become of the weirdly cute relationship between Fat Amy and Bumper (Adam Devine), the original leader of the Bellas college rivals, the Treblemakers, who are now co-led by Becca’s boyfriend Jesse (Skylar Astin) and the nervous, magic-obsessed Benji (Ben Platt). There are many great parts of this film, with the memorable final performance in particular, which may even bring a tear to the eye of the really sentimental viewers out there! Yet, the one that sticks in my mind is the a capella riff-off between five groups including American football team The Green Bay Packers! This leads to a final round of 90s hip hop and r&b covers such as this is how we do it, poison and jump which had me singing throughout! The film did struggle initially, trying to over-compensate in comedy and references to the first film, with a few of the Bellas coming across as annoying if anything. However, the use of cameos from other celebrities and characters from the original film was actually decent with Snoop Dogg, playing himself, global a capella stars Pentatonix, and Anna Camp playing Aubrey, the previous leader of the Bellas. The stand-out performance for me, and somebody who actually added a great deal of comedy to the feature was Keegan-Michael Key who played the part of Becca’s employer at the recording studio. Overall, this film was a great follow up to the first. Although not as good as the original, PITCH PERFECT 2 was full of explosive a capella covers, a large and entertaining cast, witty humour and a sentimental last half an hour, leaving it well for a following film and perhaps the next generation of Bellas? The Bellas blown away by their German rival’s final performance! Recommendation: Definitely worth a watch! Great for a date night and it is sure to have you singing along at some point. Get to the cinema and use those Meerkat Movies codes on Tuesdays/Wednesdays if you can!